There are unfortunate posts on various forums with owners of these two cameras hurling abuse at each other. There seems to be a notion that they are in competition about who has the "best" camera and once again those that feel the need to justify their purchases have decided to heap derision on those who favour their "rival"
Being in the fortunate position to own both, I cannot see what all the fuss is about. Both are excellent cameras and offer us as photographers, a level of performance and innovation only previously found in top of the range DSLR's. The following is a rough idea of how the two compare, in terms of how I use them. Both are small and light, with the A55 being somewhat bulkier. 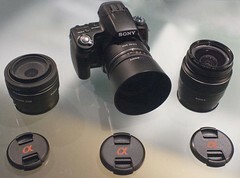 The A55 is designed more like a bridge camera and the GH2 like a reduced DSLR. I have no real preferences for either layout in terms of controls. Both sets of menus are well laid out. I had to learn the Sony menu structure from scratch and found it well organised and easy to understand. Both have an articulated screen. The GH2 has it hinged on the side, and the A55 on the bottom. Having used a GH1 for so long I was expecting to dislike the A55 layout. However, in practice, I've found I've really taken to it. It's possible to get the same angles as with the Panasonic screen and I haven't yet encountered a situation where its been a problem, or I have wished for it to be different. Build quality on both is ??? Having only used both cameras for a limited time I can't really comment on their long term durability. There's a lot of polycarbonate in both, and they both have a plastic feel. Not surprising really, since thats what they are made of! The cameras are remarkably similar in terms of pixel count, high ISO noise performance and image quality. The Sony has an APS-C sensor, but the Panasonic more than holds it own. Perhaps the A55 is slightly better at ISO 1600 > but I'm very happy with the GH2's performance in that area. Both cameras are capable of fast operation. The GH2's AF is remarkable though. Image quality is excellent from both cameras. Sharp, well detailed files with excellent colour. Both raw file formats are supported by Photoshop CS5, which I use so I don't have to use either of their bundled software packages. Neither of which are particularly good. Just as an aside, why companies don't just make all raw files .dng eludes me. They all create jpgs, so why not the same raw file format? Both have features that are unique to each. 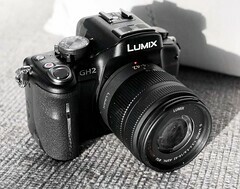 The GH2 has the multi-aspect sensor, the wonderful 1 to 1 video crop, and touch screen control. It is also able to accept 1000's of lenses via adapters, and has a great system for allowing the manual focus of these lenses. The A55 has the brilliant sweep panorama, high-speed burst, auto HDR and its Super Steady Shot stabilisation system which allows hand held video. (The aforementioned "killer feature"!) Though this can cause problems of overheating. There are also a number of very reasonably priced, light, fast primes available in the Sony Alpha range. I'm glad to be able to use both. If I was only able to have one of these cameras I would be hard pressed to make a decision. I've been an enthusiast for m4/3 for the past two years and am very aware of its attractions. The A55 has however, appeared on my horizon from nowhere, and I am very pleasantly surprised by what it offers. If you are expecting some head to head tests or a recommendation of one over the other, then thats not coming from here. My verdicts on cameras come mostly from use in the situations that I work in, and not from photographing test charts or setups. Having used them I'm very impressed with both, and each gives me things the other cannot. "Both cameras (A55 and GH2) are bristling with quality and innovation, in small, light and relatively inexpensive packages. I'm not talking about gimmicks introduced to grab a few headlines, but genuine, useful, well thought out and implemented photographic innovation that assists us as photographers to both take better pictures and extend the scope of what its possible for us to do. " I can think of nothing better on which to end.